In Grenoble, several world-leading teams working in the field of origin of life gathered around the crossdisciplinary project COOL (Cross-disciplinary approach on the Origin Of Life), bringing together the expertise of biology, planetology, astrophysics, geology, prebiotic chemistry and paleontology. One of the goal of this project is the improvement of the life detection outside the Solar System, especially in habitable zone of M-dwarfs for which the characterization of their atmosphere will be amenable in the coming decade. circadian clock, and many other processes. Therefore, the light quality is important not only for the energy requirements of photosynthesis but also for the cellular homeostasis of photosynthetic organisms controlled by the photoreceptors. How are photoperception and photosynthesis mechanistically interconnected? And how would photosynthetic organisms adapt to a stellar radiation with a spectral energy distribution different than this of earth? generate mutants that will be adapted to type M radiation. The illumination with different light qualities will be achieved by use of LED panels. The expertise of IPAG will be valuable for the construction of a LED- panel mimicking the spectrum to type M radiation. 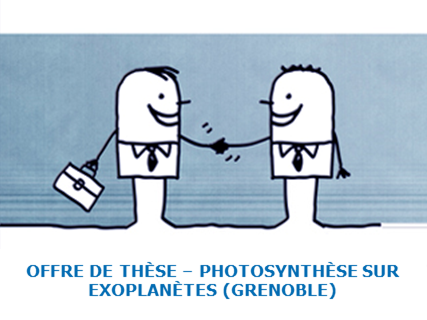 This thesis project is part of a comprehensive cross disciplinary project focused on the ‘Common Origin of Life’ (COoL) supported by the Grenoble-Alpes IDEX (ANR-15-IDEX-02) bringing together astrophysicists, chemists, biologists and humanists. The work will be co-supervised by Dr. Dimitris Petroutsos and Dr. Olivier Bastien, both working at the Cell and Plant Physiology Laboratory of CEA Grenoble. Candidate profile: The candidate should have a Master2 or equivalent in biology with a knowledge in molecular biology, microbiology and/or plant biology. The project should start by October 1st 2018.